Açai is a rich source of a class of polyphenolic flavonoids called anthocyanins, which are the same antioxidants that give wine its health benefits. Antioxidants are needed by the body to quench free radicals, whose oxidative damage contributes to ageing and degenerative diseases. The body's free radical defence system comprises several endogenous antioxidant enzymes as well as exogenous antioxidant nutrients obtained through diet. The phytochemical and nutrient compositions of a standardized freeze-dried açai powder were examined in a study at Natural and Medicinal Products Research at Washington. Among many findings, anthocyanins, proanthocyanidins and other flavonoids were found to be the major phytochemicals. Five anthocyanins were identified as predominant and minor anthocyanins. The total content of anthocyanins was measured as 3.1919mg/g dry weight. Polymers were found to be the major proanthocyanidins. The concentration of total proanthocyanidins was calculated as 12.89mg/g dry weight. Other flavonoids, namely, homoorientin, orientin, isovitexin, scoparin, and taxifolin deoxyhexose, along with several unknown flavonoids, were also detected. 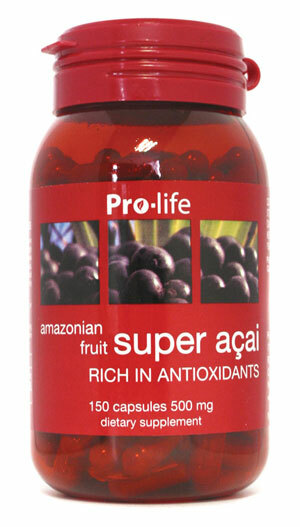 Resveratrol was also found in açai but at a very low concentration. 11.1%, 60.2%, and 28.7% of total fatty acid. Oleic acid (53.9%) and palmitic acid (26.7%) were found to be the two dominant fatty acids. Açai contains one of the highest contents known for oleic acid in the pulp of a fruit. Also found in olive oil, oleic acid may be responsible for the hypotensive (blood pressure-reducing) effects. This is particularly useful for individuals with high blood pressure. Hence açai can be used to support healthy cardiovascular system. In addition, nineteen amino acids were found and the total amino acid content was determined to be 7.59% of total weight. Amino acids are building blocks of protein and are important parts of nutrition. They are critical to life and have a variety of roles in metabolism such as muscle building. The total sterols accounted for 0.048% by weight of powder and three sterols (B-sitosterol, campesterol, and sigmasterol) were identified. These sterols can help the body prevent absorption of cholesterol. A study at the University of Florida, published in 2006 in the Journal of Agricultural and Food Chemistry, showed that extracts from açai berries triggered a self-destruct response in up to 86% of human leukaemia cells tested in vitro. The study demonstrated that açai offers a rich source of bioactive polyphenolics. In another in vitro study published in 2008, Pacheco-Palencia et al investigated the absorption and anti-proliferative effects of phytochemical açai extracts in human colon adenocarcinoma cells. Polyphenolic mixtures from açai extracts inhibited cell proliferation by up to 90.7%, which was accompanied by an increase of up to 2.1-fold in reactive oxygen species. The results support the bioactive properties of açai polyphenolics on their composition and cellular absorption. Both previous studies are in vitro studies of açai polyphenolics. Late 2008, a clinical study was conducted to examine the pharmacokinetics of anthocyanins and antioxidant effects of anthocyanin-rich açai juice and pulp in human healthy volunteers. Individual increases in plasma antioxidant capacity of up to 2.3-and 3-fold for açai juice and pulp, respectively were observed. This finding from human consumption trial is important as it demonstrates that the anthocyanins in açai can be absorbed in human plasma and its antioxidant effects can be noticed. In Canada, similar results were obtained from in vitro and in vivo studies on antioxidant and anti-inflammatory capacities of açai. It was found that the antioxidants in the açai penetrated and protected cells from oxidative damage and reduced formation of reactive oxygen species. In addition, an increase in serum antioxidants was observed after 1-hour consuming açai and an inhibition of lipid peroxidation was noticed after 2 hours of consuming açai. Oxygen Radical Absorbance Capacity (ORAC) is a method of measuring antioxidant capacities of different foods. It was developed by the scientists at the National Institute on Aging in the National Institutes of Health in Bethesda, Maryland. Correlation between the high antioxidant capacity of fruits and vegetables, and the positive impact of diets high in fruits and vegetables, is believed to play an important role in the free-radical theory of aging. Schauss A.G. et al examined the antioxidant capacities of freeze-dried açai powder using ORAC assays with various free radical sources. It was found to have exceptional activity against superoxide in the superoxide-scavenging (SOD) assay, the highest of any food reported to date against the peroxyl radical as measured by the ORAC assay with fluorescein as the fluorescent probe (ORACFL). The SOD of açai was 1614 units/g, an extremely high scavenging capacity for O2*-, by far the highest of any fruit or vegetable tested to date. Furthermore, other bioactivities related to anti-inflammation and immune functions were also investigated. Açai was found to be a potential cyclooxygenase (COX)-1 and COX-2 inhibitor. COX-2 selective inhibitor is a form of Non-steroidal anti-inflammatory drug (NSAID) that directly targets COX-2, an enzyme responsible for inflammation and pain. Therefore, açai may be suggested for use as an anti-inflammatory in diseases such as arthritis.